For Toyota WRC team competing since 2017, see Toyota Gazoo Racing WRT. TTE was started in London in 1972 when Toyota representatives and Ove Andersson, who won the Monte Carlo Rally in 1971, decided that he should drive a Toyota Celica in the RAC Rally in the autumn of that year. Andersson came ninth, beating other Japanese top teams who mostly worked with the Datsun 240Z. The Toyota Celica had to travel from Japan to the European events all the time, which was not good for the car, so Andersson set up a workshop of his own, Andersson Motorsport, which became Toyota's first European team. It was founded in 1973 with its workshop in Uppsala, Sweden. Shortly thereafter it moved to Brussels, Belgium. 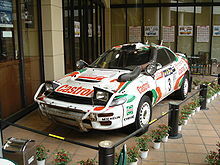 It ran Corollas and Celicas from this location, with some help from Japan for major events. Toyota Team Europe began in February 1975. In August of that year, Hannu Mikkola won TTE's first rally, the 1000 Lakes Rally in a Corolla 1600, where the competition used 2.0 L engines. In 1979 TTE moved 11 of the 20 employees from Brussels to Cologne, where the Toyota Allee was created. This was also the first time it used a Celica Turbo, and TTE won the next two Safaris. In September 1987, TTE moved to a larger premises, in which they still reside. It was also the time they revealed their first four wheel drive car, the Toyota Celica GT-Four, driven by Juha Kankkunen and Kenneth Eriksson. Carlos Sainz won the 1990 FIA World Rally Championship Title for Drivers with ST165. The newer GT-Four, ST185, made its debut at the 1992 Rallye Monte Carlo, culminating in Sainz again winning the title in this year. The ST185 also won the WRC Driver's and Manufacturer's Titles in 1993 with Juha Kankkunen, and in 1994 with Didier Auriol. In 1993 Toyota Motor Corporation bought TTE which then renamed Toyota Motorsport GmbH (TMG). At this time, as a fully owned part of Toyota Motor Corporation, Toyota Motorsport were employing 300 staff from 17 nations. In 1995 TTE was banned for 12 months from the World Rally Championship (WRC) for cheating by designing an illegal air restrictor on the ST205 that included both a bypass mechanism and spring-loaded devices to conceal it from scrutineers. In the 1996 and 1997, despite lack of works team appearance in 1996 due to the ban, TTE supported the Celica ST205 rallied by Italian HF Grifone Team, Toyota Team Sweden, Marlboro Toyota Team Belgium, and Tein Sport in the selected WRC events, before introduced the Corolla WRC in the 1997 Rally of Finland. When they returned to the WRC for 1998, they did so with a Corolla WRC driven by the crews of Carlos Sainz/Luis Moya and Didier Auriol/Denis Giraudet. They finished the season in second overall in both the Drivers' and Constructors' Championships. In 1999, however, the manufacturers championship was taken, the third in TTE's existence. In addition to spearheading Toyota's efforts in the World Rally Championship, the group has also developed and run the Toyota GT-One and Toyota TS030 Hybrid in sports car racing. The GT-One entered the 24 Hours of Le Mans in both 1998 and 1999, and the TS030 Hybrid made its début in 2012. Introduced in time for Le Mans in 1998, the GT-One first appeared at the official testing days for the race held in May. Three GT-Ones appeared, setting the 2nd, 5th, and 10th best times, easily beating out custom built prototypes which were meant to be the superior class. For the race week itself, all three cars performed admirably in qualifying by continuing their quick pace, qualifying 2nd, 7th, and 8th, being beaten only by their GT class competitor, Mercedes-Benz. For the race itself, the No. 28 GT-One suffered from a high speed accident halfway through the race, taking it out of competition. The two other entrants continued to fight on, both remaining in the top 10. However, within the closing hours, the higher ranked No. 29 GT-One suffered a gearbox failure while in competition for the race win. Thus Toyota was left to take 9th place in the race with the lone No. 27 entry, which ended the race 25 laps behind the winning Porsche 911 GT1. Their 1999 24 Hours of Le Mans started bitterly after the team was plagued by multiple Michelin tyre failures, the situation becoming somewhat reminiscent of 1998, when the No. 1 & No. 2 car were retired. Martin Brundle in the No. 1 Toyota suffered a puncture at high speed on the Mulsanne Straight, the cars rear suspension was badly damaged and he was unable (despite his best efforts) to get back to the pits. The No. 2 Toyota being driven by Thierry Boutsen was next to go when he suffered a high speed crash under the Dunlop bridge due to a rapid deflation. The car was destroyed and Boutsen suffered injury to his lower back. At the break of dawn, the No. 15 BMW was almost a lap ahead of the No. 3 Toyota which had been quietly cruising around at a steady pace. With this sniff of a win Ukyo Katayama put the foot down in the Toyota and set the fastest lap of the race. He narrowed the gap to less than a minute till again a tyre blowout befell the Toyota team again. Ukyo was however able to return to the pits for new tyres and continued. He managed to finish second after a valiant effort placing first in the GT-P class. However, they fell short of the overall victory at Le Mans, which would have made them only the second Japanese manufacturer to get an overall win (Mazda being the first in 1991). The GT-One raced only once more, a single entrant appearing in the 1999 Le Mans Fuji 1000km. Although the race mostly consisted of Japanese teams, thus leaving out most of the manufacturers that had competed at Le Mans, Toyota still had to compete against rival Nissan, who also entered their R391. In the end the GT-One would fall short once again, finishing 2nd and only one lap behind the winning R391. The GT-One program was not continued into 2000, Toyota instead turning TTE into leaders of the new Toyota F1 team. This would mark a hiatus in Toyota's attempts at Le Mans until the 2012 season, over a decade later, when Toyota decided to once again contest at the top tier of sports car racing. In October 2011, Toyota announced its return to Le Mans in 2012, with a hybrid-powered Le Mans Prototype, sporting a petrol engine similar to that found in their customer P1 car. The car would be entered in the inaugural season of the FIA World Endurance Championship, though it would miss the first round of the series. Toyota suffered a severe setback with a crash in late April preventing the debut of the car at the 2012 6 Hours of Spa-Francorchamps, but managed to get two TS030s ready by Le Mans. Unfortunately, neither car finished the race: the #8 car being driven by Anthony Davidson suffered a massive crash with a Ferrari 458 (which also fractured two of Davidson's vertebrae), while the No. 7 car hit the DeltaWing and later retired with an engine failure. Toyota continued to compete in the rest of the WEC season with a single car, collecting 3 wins including the 6 Hours of Fuji. At the 2013 24 Hours of Le Mans Toyota achieved its fourth second-place finish at Le Mans with a revised Toyota TS030 driven by Stéphane Sarrazin, Anthony Davidson and Sébastien Buemi. The sister car finished in 4th several laps down. Toyota finished the WEC season in 2nd place again, taking two wins at rain-shortened Fuji and Shanghai. Toyota announced in October 2013 that it would continue racing in the World Endurance Championship in 2014. In order to comply with new-for-2014 LMP1 rules, Toyota revealed its new car, the Toyota TS040 Hybrid. The car uses a similar hybrid system as the TS030 Hybrid but adds an additional supercapacitor at the front to allow temporary four-wheel drive. The company is headed by president Yoshiaki Kinoshita, the man formerly in charge of Toyota's global motorsports programme and previously its Champ Car engine development. Former Toyota F1 technical director Pascal Vasselon is general manager Chassis Engineering while Jens Marquardt, the former F1 team manager, has become the head of business development, although he joined BMW Motorsport in 2011. Toyota Motorsport is working with "a few dozen" customers on various projects, not all of which are from the motorsport world. Several major projects, including an iQ sports conversion, are being carried out for parent company Toyota Motor Corporation. According to the company's 2010 annual review, Toyota Motorsport has hit its financial targets for the year. Toyota Motorsport provided their TF109 Formula One car, which they developed and engineered for competing in the 2009 Formula One season, to Pirelli for tyre testing at various circuits for the Italian company, F1's sole tyre supplier. Few details are available regarding the identity of other customers, although media speculation says several leading F1 teams are using Toyota Motorsport's two modern wind tunnels and other testing rigs. In 2011 Ferrari admitted that it was using the TMG wind tunnel and was still it using in 2013 as it awaits the upgrade to its own wind tunnel. In October 2010, rumours appeared in the media that Toyota Motorsport had been sold to the HRT F1 team. These were denied by Toyota Motorsport. Their machinery was eventually acquired by Stefan Grand Prix, with TMG support. After a failed bid for the 2010 season, Toyota and Stefan Grand Prix parted ways, closing out any possible chance to see Toyota Racing return in any form to Formula 1. Toyota Motorsport supplies and supports Toyota 3.4L V8s for Rebellion Racing as a partnership with Lola Cars. TMG also runs the Toyota TS030 Hybrid in the FIA World Endurance Championship in conjunction with Oreca as Toyota Hybrid Racing. The company revealed in its annual review[when?] that it has developed an electric racing car based on the Radical sportscar, along with Cologne company e-Wolf. The TMG EV P001 was developed using knowledge Toyota Motorsport gained during its KERS development for F1 and used some of the company's dedicated engine dynos, including an 'EV component test rig'. In August 2011 it set a new lap record for an electric vehicle at the Nürburgring Nordschleife of 7mins 47.794secs. The company says this proves the ability of their technology to be competitive in racing, and that they would like to enter an electric championship. ^ "Toyota Motorsport GmbH". Toyota Motorsport GmbH official website. Retrieved 1 July 2018. ^ "Board Message". Forums.autosport.com. Retrieved 27 November 2011. ^ "TYRE". Pirelli. 2 September 2010. Retrieved 27 November 2011. ^ "Köln: Toyota-Fabrik stark gefragt — Formel 1 bei". Motorsport-total.com. Retrieved 27 November 2011. ^ Noble, Jonathan; Rencken, Dieter. "Ferrari using Toyota's wind-tunnel". Autosport. Haymarket. Retrieved 28 January 2011. ^ Straw, Edd. "Ferrari admits windtunnel switch will affect 2014 car development". Autosport. Haymarket. Retrieved 19 March 2013. ^ "Toyota not for sale". pitpass. Retrieved 27 November 2011. ^ "premium content". Autosport.Com. 29 January 2010. Retrieved 27 November 2011. ^ "premium content". Autosport.Com. 22 March 2010. Retrieved 27 November 2011. ^ "New EV lap record for TMG" (Press release). Toyota Motorsport GmbH. 30 August 2011. Archived from the original on 26 November 2011. Retrieved 30 August 2011.